The ‘Marble Corridor,’ is my third and final memoir. These stories document, not so much my own life but more my experiences with some of the extraordinary people I have been fortunate enough to meet and engage with along the way. From childhood, through being a student and junior doctor to becoming a consultant it has been my privilege to meet and work with some amazing people and in these books I have documented just some of our adventures both humorous and sad. 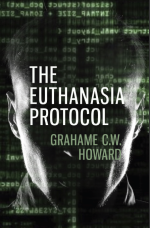 In contrast ‘The Euthanasia Protocol,’ is a dark, satirical glimpse into the future which is proving to be disturbingly prescient. 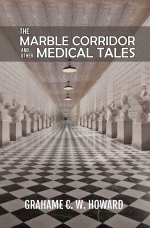 Set within a South London hospital in the 1970s, The Marble Corridor is the first of four stories which chart the progress of a newly-qualified doctor from houseman to consultant. It tracks the multifarious events of a single weekend spent working ‘on-call’ and the unremitting pressure creates a sense of tension which permeates this tale. Towards the end of this marathon stretch of duty, sleep deprivation causes the young doctor to hallucinate and he begins to confuse illusion and reality with some strange and incongruous outcomes. Beyond the Marble Corridor continues to document the author’s progress through a series of posts, highlighting some of the ethical and moral issues posed to junior doctors along with the hierarchical structure which had to be managed to progress in hospital medicine. ‘The Ivory Tower,’ is a humorous interlude as the author spends time in a renowned academic unit while the final part, ‘Pastures New,’ documents the authors time as a consultant concentrating on a number of aspects of his practice including his work for a charitable institution, examining for one of the Medical Royal Colleges and the tragic story of one particular patient. Here, as in life, humour and tragedy are intertwined. In this stark and at times bitingly satirical story we are presented with a vision of the future, in which traditional religion is banned and the State is governed by a series of Life Protocols. Drawn up by a young and idealistic civil servant called Giles, the Protocols soon become grossly misinterpreted as an end in themselves, rather than as an aid to good government. Society becomes slavishly adherent to these documents, to the extent that they begin to take on a pseudo-religious significance. Among the Protocols is one addressing the problem of an ageing population, and this Euthanasia Protocol is implemented throughout the country as an income-generating yet socially acceptable method of age control. Giles rapidly becomes disillusioned by the way in which his concept of government has been misused and he attempts to rectify the situation, only to fall foul of the system himself and be condemned to a life of ignominy. Many years later he signs up for voluntary euthanasia only to meet a young boy who makes him realise that life is worth living and he seeks to appeal his euthanasia order. The boy then escapes to the relative safety of Dalriada where he is pursued and ultimately captured by the Protocol Enforcers. There follows a battle, both physical and ideological, between the growing boy’s commonsense and the ever-expanding and all-powerful Protocol and its perpetrators. Written in a gently humorous, allegorical style, the story addresses many of the issues which plague society today. Its futuristic scenario offers a frightening yet wholly credible insight into what may happen if we, as human beings, cease to think for ourselves and rely uncritically on technology to shape our lives. Available from Amazon and all good bookshops, for further details contact Austin and Macauley. 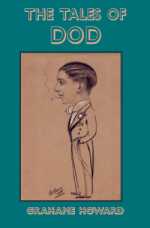 These delightful stories chart the stuttering and at times quite hapless progress of ‘the Spoz’, (so named by his brother ‘the Woog’) from Norwich schooldays through his time as a student at a prestigious London medical school in the 1970s. From his initial interview at St Thomas’ Hospital – an institution he chose because he had never heard of it and on that rather dubious basis thought he was more likely to be accepted – to his final exams, the book documents the author’s painful progress as an immature seventeen year old away from home for the first time. Sexually naïve, he devotes much of his time attempting to lose his virginity, while his excessive beer drinking hampers his success and results in several awkward brushes with the London constabulary. Chronically impecunious and homeless for several months, Spoz devises various hair-brained money-making schemes and ultimately has to take extensive time out of his studies to work on a nearby building site. From there he witnesses the bombing of Westminster Palace by the IRA, while his absenteeism from classes almost results in a premature end to his already unpromising career. 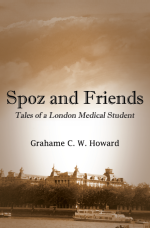 While always infused with the author’s characteristic humour, the Tales of Spoz offer the reader a more serious yet unobtrusive social commentary on the problems of being a student in that era, charting the often tortuous transition of a group of young men from immature schoolboys to responsible young doctors. Only available through the authors website - contact me. ‘The Tales of Dod’, chronicle the hapless progress of the Howard family following their move from London to Norwich in the 1950’s. The focus of the stories are the eccentricities of the Dod—so named by his elder son the Woog. Dod should have been an Edwardian gentleman of leisure but sadly he could be neither Edwardian nor a man of leisure. Dod was a man who raised drinking to an art form, who would cross county borders to get an extra half hour’s drinking time. Whether it is by using an electric frying pan to defrost the back toilet; reading the Christmas story in church in the run up to Easter or accidentally voting himself in as chairman of the Catton Ward Conservative party while asleep; Dod sails majestically through life’s storms, oblivious to the chaos he causes around him. Dod’s faux pas know no bounds from weddings to funerals. His dodgy money making schemes such as mending broken musical instruments are matched by his sons’ home made exploding cigarettes and turkey plucking initiatives. Drinking and the hostelries of the lovely City of Norwich are the life-blood which runs through the pages of this book. The Constitution Tavern is central to many of the stories such as the unfortunate episode of the giant inflatable condom. These stories are humorous, gently ironic and a vignette of a time not long past, but now barely recognisable.